The accepted story behind the name of this one is that it was made in honor of the UK’s King Edward VII at the turn of the 20th century. It uses sherry, which I don’t often mix with. Sherry is a fortified wine, so while fortified, and therefor having more backbone than a regular wine, it is still a wine, and that means that you have to use it rather quickly before the flavor goes off. Fino sherries, the driest, lightest and most delicate, are particularly short-lived. It was quite fun to work with sherry though, and since I had a whole bottle I went on a sherry cocktail kick, but I’ll save that for another post. I used Axel’s 3 dashes of bitters as I’m a bitters fan. This is really quite a nice drink. Very drinkable and fresh. 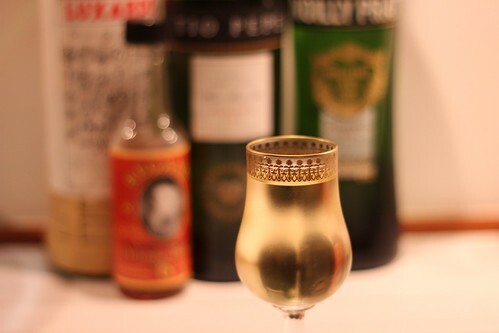 I used Fino sherry, and I’d be curious to try it with an Amontillado to see what that would do with the flavors. All said, something I would definitely drink again, assuming that I have sherry on hand.